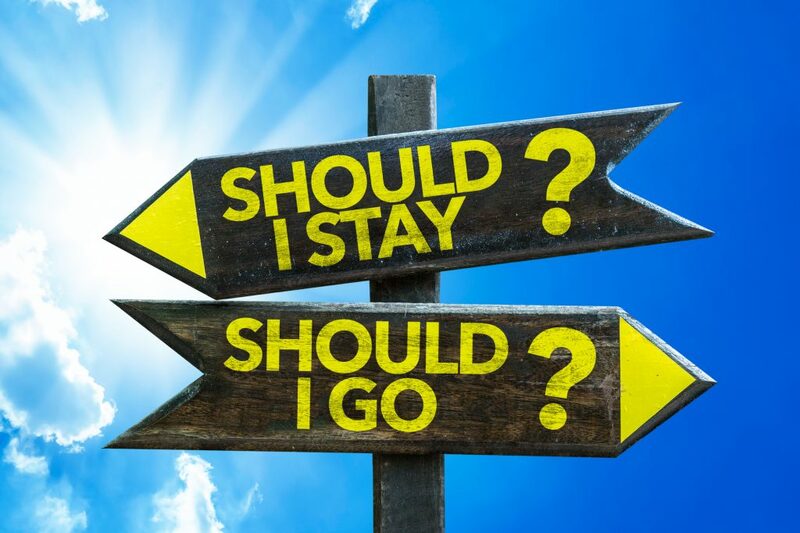 A common career decision is whether to move for a job opportunity or to stay in a place where you already have strong ties to family and friends. There isn’t one right answer, of course, as people have different values and priorities, so I interviewed people who made different decisions to hear their perspectives for the benefit of people who might be considering whether to move for a job now. As you will read, some people chose to move for job opportunities, some people chose to stay in a place for the community they have already built, and some people have done both at different points in their lives. Maybe because of the nature of human decision-making (cognitive dissonance causes us to rationalize as a good decision whatever path we chose), no one interviewed regretted their choices. “I was born in America but I grew up in rural Ireland, so I have dual citizenship. In 2011, I decided to immigrate to America since Ireland was the country second hardest hit by a recession (Greece being the first). All my family and friends remained in Ireland, so it was a hard decision to leave them. When I arrived in America, I had $200 and a backpack filled with clothes. In the beginning, I worked as a door-to-door salesman, which was worst working experience of my life. I was the only person I knew in Southern California who walked everywhere because I didn’t yet have enough money for a car. “I moved for what I thought was my dream job with The Walt Disney Company. I relocated my family about 60 miles north of our hometown (Chula Vista day in south San Diego). It’s not too far, but also not close enough to our previous life. If you would have asked me the year it happened (2015), I would have told you I regretted the decision. The interview process with Disney took 8 months for me and I was only able to last there for 6 months. I tried to stick it out for at least 2 years but it would’ve mentally broken me down to stay any longer than I did. I had to pay back the relocation expenses incurred (approximately $15,000) and my husband’s commute remains over 45 miles and an hour+ daily as a result. However, we love our home and neighborhood AND the other “blessings in disguise” that have resulted from the move. So, despite the challenges that year, I believe everything happens for a reason and that I ended up right where I’m supposed to be. “I have made three dramatic moves for my career in the past 13 years, each time to an area where I knew no one. The first time I was single and I moved to a small town in Tennessee for a job. I left my friends and family — everyone I knew — behind. The second and third times I was married, but we still knew no one in the area, and both my husband and I are introverted, so it’s been an interesting experience that we’ve both coped with differently. For me, it has meant that most of my personal relationships have been forged in professional settings rather than through more traditional family, educational, or social settings. “I moved to Austin, Texas, nearly 4 years ago, only knowing one person in town. It was hands down the best decision I ever made. I was reeling from a terrible breakup and was ready for a big change. I picked a place on a map, secured a job before I left, sold all my things and drove 24 hours with my mom and two dogs to Austin. The first 6 months were really hard, I didn’t have any friends only knew a couple coworkers and a few connections through the one person I knew. “I moved for a job 4 years ago. I had graduated college a year prior with a teaching certificate and the desire to stay in my hometown (Austin, TX), but the job prospects were pretty bleak. This prompted me to begin looking in other cities in Texas. Eventually, I found a job in Katy, TX (just outside of Houston) two weeks before the school year was to begin. The Saturday after I was offered the position, I went to find an apartment and moved to Houston the next week. Accepting the offer was hard at first; I had been applying to jobs for months, and I didn’t think that an out-of-city job was really going to happen. I had begun to lose hope that I would move anywhere and was coming to terms with it. In fact, I was even kind of happy about it. A big change wasn’t going to be in the cards, and I’d get to stay in my hometown with my friends who had also moved home after college. We’d keep going to the same bars and doing the same things that we’d always done, and that thought was comforting. Staying there was certainty, and moving was uncertainty. Certainty sounded pretty good; I knew what to expect from certainty. But then I got the offer, and it was a little surreal and a bit jarring. I didn’t know if I even wanted to still move. I didn’t know what would be out in Houston. It’s a big city and I’d never been before; I was just really scared. I didn’t know what to do. I don’t remember exactly what influenced my decision, but for some reason, I decided to take the plunge and accept the offer. “Rather than moving away from family for a job, I moved away from my job in order to be closer to family. I spent almost six years living in Washington, DC and working as a communications director for a national nonprofit. It was long hours, hard work, and a lifestyle that kept me tethered to two cell phones. Not one, but TWO! I realized I needed to re-prioritize my life when I found myself answering calls on Christmas Eve. I should have been sitting by the fireplace with my family, but instead I was talking to reporters. In 2015, I took a big leap. My then-boyfriend and I discussed moving back to my home state of New Jersey to be closer to family. It was the best decision I ever made (other than marrying that boyfriend and having one beautiful son together almost 4 years later). We spent two months in D.C. waiting for our lease to expire, and during that time I created my own freelance writing and editing business. I see my family every day, I make more money than I did in Washington, I work from home, and I get to make my own hours. “My husband and I moved ten times in eleven years for our jobs and for our education. Our most recent (and final?) move was back to Chicago, the place that feels most like home to us. In our twenties, my husband, Dan, and I crisscrossed the country as we pursued our graduate degrees and our jobs. We moved from Maryland to Ohio to California to Illinois. As a medical resident, my husband had little choice in where we would move. He ranked his top medical residencies, and on Match Day we learned we would spend the next five years in California and Illinois. All of these moves were good choices for us. We were doing what we were supposed to do. After living in Chicago for four years and having three kids during that time, our next move took on greater significance. It was no longer just about us. We needed to figure out if the move would be beneficial for the entire family. Dan accepted an excellent job offer in Knoxville, Tennessee because it seemed like a wonderful place to raise the kids. The problem was we didn’t have any family or friends nearby. We relocated to Knoxville after only two visits there. Knoxville is beautiful and the southern charm is palpable. We made some mistakes, though. Because housing prices were much lower in Knoxville than in Chicago, we could afford a brick colonial home in a nice neighborhood. We soon learned that our neighbors had kids on high school sports teams while our kids were still in diapers. Our life stages didn’t quite match up and it wasn’t easy to break into the close-knit community. After some deep thinking, we realized that Knoxville wasn’t the long-term place for us. “I started my career in my hometown with a manufacturing organization in 2003. Over time, I’ve received and declined many job offers from abroad. Each time I explored the job market to test my market value, I had to re-evaluate my decision to stay near friends and family. In 2013, I received a particularly wonderful opportunity and I discussed it with my father. He said that he hoped I would stay as my moving away would take not only me away from him in the last years of his life, but his grandson (my son), too. I decided to stay and he passed away in 2016. If you found these experiences helpful, please share this article.